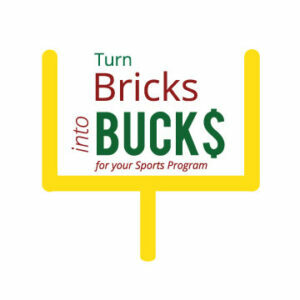 Dolores Chili will donate a free week’s supply of chili to your sports team, organization or club to help you see how you can maximize your profits by adding some of our chili. 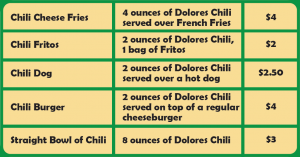 Adding just two ounces of Dolores Chili can add up to $1.50 profit per hamburger or hot dog! 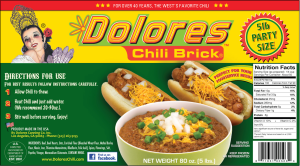 Our 5-pound tray of Dolores Chili Brick is available at Smart & Final and Restaurant Depot at a great price, so it can become a regular staple for your snack bar. All you have to do is thaw and add water, and it’s ready to server over your popular snack bar items. 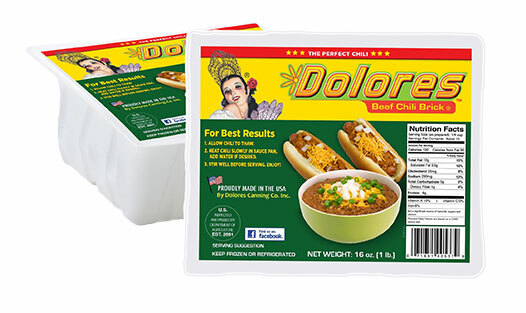 Fill out the application below to receive your free week’s supply of Dolores Chili. Someone from Dolores Chili will be in touch with you right away.